This is another case of hearing plenty of good reviews in advance. I'm happy to say, my experience was good as well. I met a blind friend there for lunch. It was a little tight for a person with their guide dog, but we were able to find a table in the corner where Yalie was unobstructive. I read the menu off to her and there were quite a few nice things for the day. There was also a deli case filled with delicious looking salads, which I should have taken a picture of. Next to the register were a bunch of tasty looking baked goods ranging from cookies to scones and carrot cake. The chocolate chip cookies were so delectable looking that I couldn't resist. My friend is a vegetarian and so she chose the veggie panini. 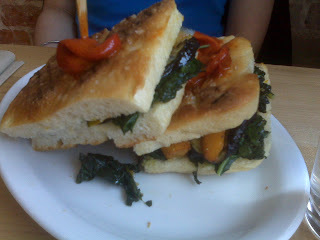 From what I saw it was filled with roasted peppers, onions, and spinach. I chose the smoked trout sandwich, which turned out to be open faced. 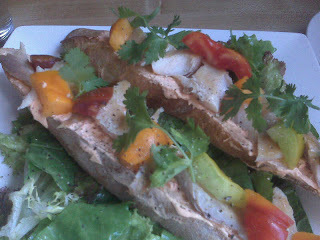 There was a flavored mayonnaise, the pieces of smoked trout, some cilantro, and chunks of heirloom tomatoes. I enjoyed it and the light salad underneath. That chocolate chunk cookie was a winner as well. It was large, fresh, moist, and filled with slivers of chocolate versus chips. A quality cookie compared to some wrapped-in-saran cookies you see at other establishments. I look forward to going back and try some of the salads in the case.